The National Transportation and Safety Board says it can’t determine what caused a Learjet to crash near a suburban airport outside Chicago. An initial report by the NTSB, released Thursday, did not come to any conclusion about the accident that left a pilot Stephen Ellis and co-pilot Ryan Daenzer dead, the Chicago Tribune reports. A full investigation could take six to 12 months. According to the Federal Aviation Administration, the Learjet was cleared for landing at Wheeling Exeutive Airport and was making an approach to Runway 34 at the airport about 1:30 p.m. on January 5 when it went down about a quarter-mile north of Euclid Avenue. 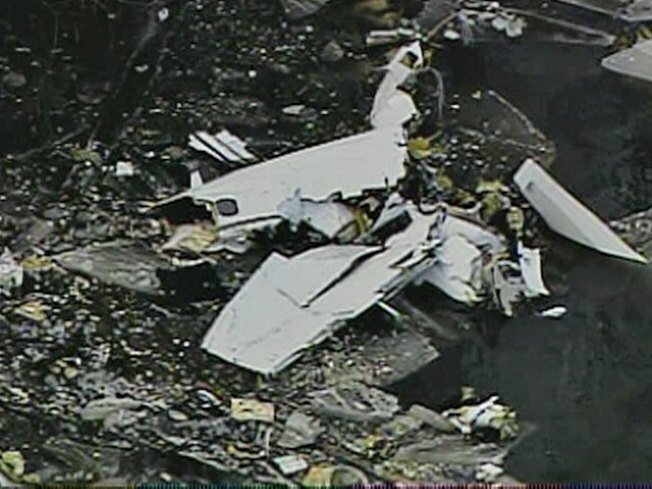 The bodies of the pilots were removed from the wreckage the next day, and a cockpit voice recorder was taken by the NTSB for examination. A Royal Air Cargo plane went down Tuesday on the west bank of the Des Plaines River near the Chicago Municipal Airport in Wheeling. The radar track indicated that the pilot had made his approach from the east, but after making a right turn to line up with the runway made a sharp turn to the right and a northeasterly heading, possibly a correction for overshooting his initial turn. It was after the plane made another turn back to a more westerly heading that it disappeared from radar at about 2,000 feet. Conditions at the time of the crash were what most pilots would consider perfect, with winds blowing nearly straight down the runway, at 10 knots. Clouds were broken at the time at about 6,000 feet. The turn from the approach phase to the final line-up with the runway is considered the most critical part of any landing, according to officials. The Royal Air cargo jet, tail number N720RA, had abandoned a similar approach days earlier. The reason for the plane's return is unknown.